BELFAST — Essentially competing against herself, Waterville senior Bethanie Brown took a run at the course record Saturday at the high school cross country state championships. Brown missed the record at Troy Howard Middle School by eight seconds but nonetheless posted the fastest girls time of the day in any class as she cruised to the Class B title in 17 minutes, 56.32 seconds. The day’s second best time over the 5K course belonged to Lawrence senior Erzsebet Nagy, who won the Class A race in 18:50.87. Both Brown and Nagy finished second in last year’s state meets. Unlike last week’s regionals that were run on a sloppy course, Saturday’s conditions were dry and unusually warm as temperatures neared 70 degrees. Brown led nearly from start to finish, opening up a 50 second lead over runner-up Kirstin Sandreuter of Greely by the two mile mark. Her time was a second better than the meet record she set a month ago on the same course at the Festival of Champions. Brown’s time was more than a minute faster than the time she posted at last year’s state meet. Nagy also slowed herself at the start. Nagy placed second to Abbey Leonardi last year and with the Kennebunk runner’s graduation, she had set her sights on a state title. “I was so nervous the whole day, so nervous,” Nagy said. 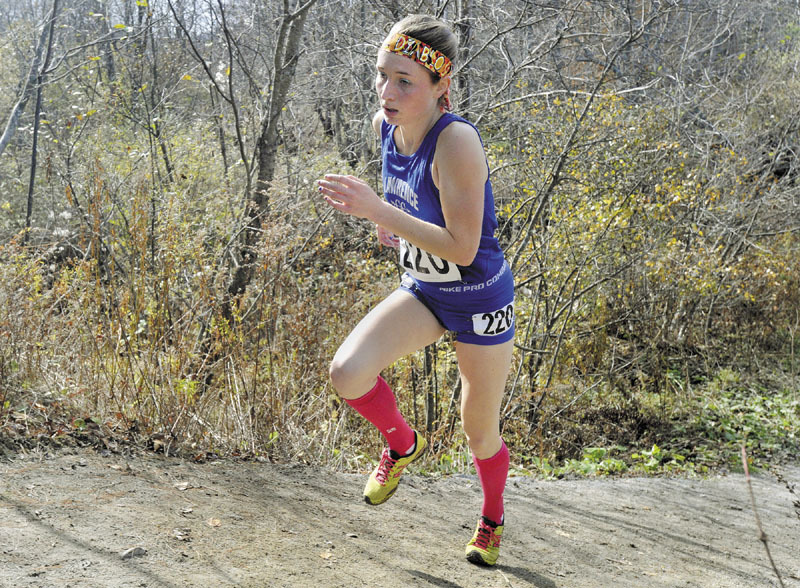 Nagy wore her trademark knee-high pink compression socks, but not the headband she’s worn in every cross country race. She replaced it with an El Diablo headband and bettered her time considerably. “I guess this is lucky, too,” she said. The Waterville girls finished third in the Class B race behind Mount Desert Island and Camden Hills. In addition to Brown’s win, the Purple Panthers got a 13th place finish from Tiana Tucker, 25th from Erica Jenson, 38th from Lauren Brown and 48th from Lara Bluhm. Nick Derosby led the Waterville boys with a 49th place finish while Winslow’s Nickolas Shuckrow placed 25th. The Mt. Blue boys finished fifth, getting a fourth-place finish from Josh Horne and 10th from Justin Tracy. “Our No. 5 guy (Felix Bonnevie) ran a lifetime best,” Mt. Blue coach Kelley Cullenberg said. Also in Class A, Messalonskee’s Nathan Skvorak placed 22nd while teammate Olivia Poulin finished 24th in the girls race. Madison’s Tristan Rich took 24th in the Class C boys race while Bronte Ellis of Madison finished 19th in the girls race. Ellsworth junior Dan Curts posted the fastest time of the day at 15:47.52, just four one hundredths of a second ahead of Fryeburg’s Silas Eastman. The pair matched one another stride for stride until Curts opened a 10-yard lead with less than a quarter mile to go before Eastman drew even.